By 2009, he broke Conway Twitty's previous record for the most number-one hits on Billboard's Hot Country Songs chart when his 44 number one singles surpassed Twitty's 40. Counting all music charts, Strait has amassed a total of 60 number-one hits, breaking a record also previously set by Twitty, and giving him more number one songs than any other artist in any genre of music. Strait is also known for his touring career when he designed a 360-degree configuration and introduced festival style tours. For example, the Strait Tours earned $99 million in three years. His concert at AT&T Stadium in Arlington, Texas, in June 2014 drew 104,793 people, marking a new record for largest indoor concert in North America. Strait was successful innovating country music and in numerous aspects of being a part of popular music. George Harvey Strait Sr. was born on May 18, 1952, in Poteet, Texas, to John Byron Strait Sr. (January 11, 1922 – June 4, 2013), and Doris Jean Couser (June 26, 1930 – January 30, 2010). He grew up in nearby Pearsall, in Frio County, where his father was a junior high school mathematics teacher and the owner of a 2,000-acre (810 ha) cattle ranch outside of Big Wells, Texas. The family worked at the ranch on the weekends and in the summers. When George was in the fourth grade, his father and mother were divorced, and his mother moved away with his sister, Pency. George and his brother John Jr. (1950–2009), were raised by their father. Strait began his musical interest while attending Pearsall High School, where he played in a rock and roll garage band. The Beatles were popular when Strait was in high school. "The Beatles were big", Strait confirmed. "I listened to them a lot and that whole bunch of groups that were popular then". His musical preference soon turned to country with singers Hank Thompson, Lefty Frizzell, Merle Haggard, George Jones, Bob Wills, Hank Williams, and Frank Sinatra influencing his style. Strait did not tune to the country music radio often as a youth, usually listening to the news and the farmer's report. His introduction to country music came mostly by way of live performances, which, according to Strait, could be heard in every town in Texas. He eloped with his high school sweetheart, Norma. The couple initially married in Spain on December 4, 1971. That same year, he enlisted in the United States Army. While stationed at Fort Bragg in North Carolina as a part of the 82nd Airborne Division, Strait began performing with a U.S. Army-sponsored band, "Rambling Country", which played off-base under the name "Santee". On October 6, 1972, while still in Fort Bragg, George and Norma had their first child, Jenifer. After Strait was honorably discharged from the Army in 1975, he enrolled at Southwest Texas State University in San Marcos and graduated with a degree in agriculture.it is now just Texas State. During his college years, Strait joined the country band Stoney Ridge, answering a flyer the band posted around campus looking for a new vocalist. Strait renamed the group the Ace in the Hole Band and quickly became the lead; they began to perform at different honky-tonks and bars around south and central Texas, traveling as far east as Huntsville and Houston. They gained a regional following and opened for national acts such as The Texas Playboys. Soon, his band was given the opportunity to record several Strait-penned singles including "That Don't Change The Way I Feel About You," and "I Can't Go On Dying Like This" for the Houston-based D label. However, the songs never achieved wide recognition, and Strait continued to manage his family cattle ranch during the day in order to make some extra cash. While he continued to play with his band, without any real connections to the recording industry, Strait became friends with Erv Woolsey, who operated one of the bars in which the Ace in the Hole band played, and who had previously worked for the major label MCA Records. Woolsey convinced some of his Music Row (Nashville) connections to come to Texas and to listen to Strait and his band play. Impressed with the performance, but concerned that they couldn't market the Western Swing sound that the band featured, they left without a deal. After several unsuccessful trips to Nashville in search of a record deal in which Strait was turned down by every label in town, he considered giving up music altogether. He was offered a job designing cattle pens and decided to take it. He gave the band notice that he was leaving, but after a discussion with his wife, she convinced him to give music one more year. Not long afterward, MCA signed Strait to a recording contract in February 1981. The initial deal was for one song. If the single did well, the label would then consider doing an album. The Ace in the Hole band remained with Strait, performing as the backup and touring band for the now solo act. In the spring of 1981, Strait released his first single for MCA Records, titled "Unwound", which climbed to #6 on the Billboard Hot Country Songs chart that year, and was included on his debut album Strait Country. The record featured two more singles including "Down and Out", a No. 16 hit for Strait, and "If You're Thinking You Want a Stranger (There's One Coming Home)", which reached number three early in 1982, sparking a string of Top Ten hits that ran well into the 1990s. 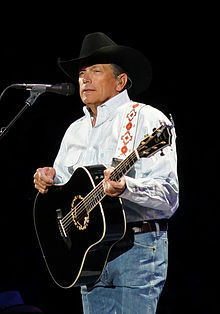 Strait Country was hailed by critics as a traditionalist breakthrough that broke the trend of pop-influenced country prevalent at the time. The year 1982 also saw the release of Strait's second album, the critically acclaimed Strait from the Heart, which featured the first number one single of his career, "Fool Hearted Memory", and the top five "Amarillo by Morning" originally sung and written by Terry Stafford in 1973. In 1983, Strait made his first appearance at the Houston Livestock Show and Rodeo when the headlining star, Eddie Rabbitt, came down sick with the flu. Performing at that rodeo has since become a mainstay throughout his career, making more than twenty appearances at the Rodeo, and playing to a total of more than one million fans. Strait recorded 17 subsequent No. 1's in the decade, including a string of five that lasted from 1983–84 from his next two albums Right or Wrong, his first number one album and the CMA award-winning Does Fort Worth Ever Cross Your Mind. The next year, he won the CMA award for top male vocalist, and released his first Greatest hits compilation, which featured songs from his first three albums. Also in 1985, Strait released Something Special, the third straight number-one album of his career, featuring the number-one single "The Chair". In 1986, Strait repeated as the CMA vocalist of the year and released his fourth No. 1 album #7. Strait and his family were struck with tragedy when his 13-year-old daughter, Jenifer, was killed in a one-car, non-alcohol-related accident. She was riding in a Ford Mustang driven by Gregory Wilson Allen, 18, of Staples, Texas. Allen was subsequently charged with a Class A misdemeanor for vehicular homicide. Mike Cox, spokesman for the Texas Department of Public Safety in Austin, said, "The responding trooper determined the cause of accident to be excessive speed and that the car did not negotiate the turn properly. Jenifer was riding in the front passenger seat, and none of the four occupants was wearing seat belts at the time. When the vehicle flipped over onto its passenger's side, Jenifer was partially ejected, killing her on impact. The incident caused Strait to greatly limit his contact with the media. He stopped doing interviews for many years after the accident as he and his family did not wish to discuss Jenifer's death. His grief did not hinder his performance, however, or his output, as he went on to release 11 straight No. 1 hits, starting with "Nobody in His Right Mind Would've Left Her" in 1986 and ending with "Ace in the Hole" in 1989. The singles spanned four albums, including #7, Ocean Front Property in 1987, If You Ain't Lovin' You Ain't Livin' in 1988 and 1989's Beyond the Blue Neon, all of which reached the number one spot on country album charts. Ocean Front Property was the first country album to ever debut at No. 1 on the charts by any artist. The streak included such songs as "Ocean Front Property", "All My Ex's Live in Texas", "Famous Last Words of a Fool" and "Baby Blue". Strait finished the decade by winning the CMA Entertainer of the Year award in 1989. A year later, he won the award again. Strait began the decade with the release of his tenth studio album, Livin' It Up, which featured two No. 1 hits including "Love Without End, Amen", his first multi-week hit, and "I've Come to Expect It From You". Both songs remained No. 1 for five weeks in 1990. Chill of an Early Fall shortly followed in 1991, and received positive reviews. Entertainment Weekly noted that the album marked a shift for Strait from "repeating himself" in his previous works to producing different material. It produced the No. 1's "If I Know Me" and "You Know Me Better Than That", but ended his streak of 31 straight top ten hits with the cover of "Lovesick Blues", which peaked at No. 24. The record blocked his run of eight top charting albums with its peak of No. 4. In the spring of 1992, Holding My Own was released. It did not produce any No. 1s but did include two top five songs including "So Much Like My Dad". Later in 1992, Strait played the main character in the movie Pure Country, and released the film's soundtrack. It was his most successful studio album, producing such hits as "Heartland", "I Cross My Heart", and "When Did You Stop Loving Me", and peaked at No. 1 and No. 6 respectively on the Country and Billboard 200 album charts. The success continued with his next album, Easy Come, Easy Go in 1993, which reached the top five on the Billboard 200 and featured the hits "I'd Like to Have That One Back", "The Man in Love with You", and the No. 1 title track. His next four albums, including Lead On in 1994, Blue Clear Sky in 1996, Carrying Your Love with Me in 1997, and 1998's One Step at a Time, all charted at No. 1, with Blue Clear Sky claiming the spot on its debut week, and Carrying Your Love with Me peaking at No. 1 on the Billboard 200 for the first time in Strait's career. This series of albums produced eight number one singles for Strait, including "You Can't Make a Heart Love Somebody", "Carried Away", "One Night at a Time", and "I Just Want to Dance with You". During this period, Strait also released a four-disc box set career retrospective, Strait Out of the Box, in 1995, which became the second-best-selling box set ever with shipments of 8 million in the United States. He was named as the CMA's Top Male Vocalist in 1997 and 1998. Starting in 1997, and continuing until the first year of the 21st century, Strait headlined the George Strait Country Music Festival, which included artists such as Tim McGraw, Faith Hill, Kenny Chesney, Alan Jackson, and others. In an effort to introduce these acts to as many fans as possible, the festival promised not to visit any market more than twice. It played only a small number of dates, usually no more than twenty a year, but still managed to be the ninth-biggest-grossing tour of 1998. Strait completed the decade with the album Always Never the Same in 1999, which peaked at No. 2 on country charts and matched the cross-over success of Pure Country by reaching No. 6 on the Billboard 200. The record produced the hits "What Do You Say to That", "Meanwhile", and the No. 1 "Write This Down". Reviews of the album's material were generally moderate, but Entertainment Weekly observed that at this point in his career, Strait could record the "most lightweight" material and "make it soar" on the radio with his "grace". All in all, Strait scored 17 No. 1 hits on the Billboard country airplay charts in the decade, and carried his successes into the next century. Strait released a self-named album in 2000, which despite a No. 1 and No. 7 showing on the country and Billboard 200 album charts, produced no No. 1 singles, and was the first studio album of his career to not be certified platinum. The singles "Go On" and "If You Can Do Anything Else" were released from the record, with both peaking in the top five. In May 2001, The Road Less Traveled was released. Reviews for the album were mostly positive, Rolling Stone described it as sticking to the formula "but adds a few twists that make it superior to his last few releases." It featured "vocal processing", and was considered by some critics as an experimental album. Three singles were released from it, two of which reached No. 1, including "She'll Leave You with a Smile", his 50th on combined charts and "Living and Living Well", both of which reached the top 30 of Billboard Hot 100, with the former peaking at No. 23, Strait's highest rank on the chart. The single "Run" peaked at No. 2 and reached No. 34 on the Billboard 100. Strait released two records in 2003. For the Last Time: Live from the Astrodome was a recording of the last Houston Livestock Show and Rodeo to take place in the Astrodome. The performance itself, set the record for paid attendance at the venue, with 68,266 people, breaking Latin superstar Selena's previous record of approximately 67,000 in 1995. His next album, Honkytonkville was described as "a fiery set of hard country", and was praised "for its mixture of the old Strait with his modern, superstar self." It didn't produce any No. 1's for Strait but included the hits "Cowboys Like Us" and a cover of Bruce Robison's "Desperately". His 2004 performance at Reliant Stadium set a new Rodeo attendance record, with 68,679 spectators. That year he issued a Greatest Hits package billed as 50 Number Ones, chronicling the No. 1 hits of his career from all charts, starting with "Fool Hearted Memory" and ending with "She'll Leave You With a Smile." A new track, "I Hate Everything", was also included, and became his 51st overall Number One in 2004. The next year, Somewhere Down in Texas arrived, which produced the hit "You'll Be There," marking Strait's first appearance on the Adult Contemporary chart. The next year, he embarked on a tour that included only 18 performances but grossed over $15 million. He attributed this success to the fact that he and his band are "musically very tight," have a large pool of songs to draw from, and perform those songs very similarly to how they sound on their albums. On October 3, 2006, Strait marked his 30th year in the music industry with the release of a new album titled It Just Comes Natural. The album was recorded in Key West, Fla. in Jimmy Buffett's Shrimp Boat Sound Studio (said to be a better recording location due to lack of allergy flare ups during recording process), which was also the recording location of "Troubadour". It featured fifteen new songs. Strait's long-time friend and songwriter, Dean Dillon co-wrote two of the songs on the album. It received generally positive reviews from critics. People, in their four-star review, remarked that "If ever there was a natural in country music, it's Strait," while USA Today raved that "he continues to make such consistent quality look easy". The first single from the album, "Give It Away" reached No. 1, making one of its co-writers, country legend "Whispering Bill" Anderson, the first songwriter to have a #1 hit in five different decades. The title track, "It Just Comes Natural" became his 42nd Billboard No. 1. In 2007, "Wrapped" reached No. 1 on the Mediabase 24/7 country music charts, giving Strait his 55th overall number-one single. From January through April of that year, Strait headlined a 23-date arena tour with country music legend Ronnie Milsap and then newcomer Taylor Swift. He released a new album titled Troubadour on April 1, 2008. The CD contained 12 tracks, including a duet with Patty Loveless and Craig Lembke with long-time songwriter Dean Dillon. The lead single from the album, "I Saw God Today", debuted at No. 19 on the Radio and Records and Billboard charts. It is the highest debut ever for a single from Strait and the fourth highest debut for a song in country music history. Troubadour debuted at No. 1 on the Billboard Top 200 album charts, selling over 160,000 copies in its first week of release. "River of Love" the 3rd single from the album became his 57th number-one song in 2009. In April 2009, Strait was honored by the Academy of Country Music with the Artist of the Decade Award, which was presented to Strait by the previous ACM Artist of the Decade, Garth Brooks. In June of that year he headlined the first event at the new Dallas Cowboys Stadium in Arlington, Texas. Strait's single "Living for the Night" was released on May 28, 2009, and was written by Strait, his son Bubba, and Dean Dillon. The song was the lead single from his album Twang, released on August 11, 2009. Twang was certified gold for selling over 500,000 copies. In 2010, Billboard ranked Strait No. 1 in the top 25 country artists of the past 25 years. On September 6, 2011, Strait released the album, Here for a Good Time, which yielded two No. 1 singles—"Here for a Good Time" and "Love's Gonna Make It Alright"—bringing Strait's No. 1 singles total to 59. The album's third single, "Drinkin' Man", was less successful, peaking at No. 37. In October 2012, Strait released the single "Give It All We Got Tonight", which was included on his album Love Is Everything, released on May 14, 2013. The song initiated a "60 for 60" movement by Strait's label, to make the song his sixtieth number-one single on all country charts while he was still 60 years old. The song reached the top of the Mediabase charts in May 2013. The album's next single "I Believe" reached No. 50 on The U.S. Country Airplay chart, making it Strait's first single to miss the Top 40. Strait won the 2013 CMA Entertainer of the Year award. In November 2013, Billboard presented Strait with its Legend of Live honor during the 10th annual Billboard Touring Awards ceremony. The award honors the concert industry's top artist based on Billboard's Boxscore chart and box office performance. Strait is the first country artist to receive Billboard's highest touring accolade. On April 19, 2015, Strait made a guest appearance at the 2015 ACM Awards, he performed "All My Ex's Lives In Texas" and his new single "Let it Go". In 2016, Strait was selected as one of 30 artists to perform on "Forever Country", a mash-up track of Take Me Home, Country Roads, On the Road Again and I Will Always Love You which celebrates 50 years of the CMA Awards. On September 26, 2012, Strait announced that he was retiring from touring, and that his Cowboy Rides Away Tour would be his last. Tickets for both arenas and stadiums on the Cowboy Rides Away Tour sold out in a matter of hours. The tour started on January 18, 2013 in Lubbock, Texas and was divided into two legs: 21 concerts in 2013 and 26 concerts in 2014, for a total of 47 concerts. The tour ended in Arlington, Texas on June 7, 2014. Strait was supported on the tour by his longtime eleven-member touring group, the Ace in the Hole Band. For the 2013 leg, Martina McBride was the opening performer. On January 9, 2014, Strait initiated the second leg of the tour, which featured the opening performers Jason Aldean, Eric Church, Martina McBride, Miranda Lambert, Little Big Town, Vince Gill, Gloria Estefan, Lee Ann Womack, Merle Haggard, Chris Young, Ronnie Dunn, Luke Bryan, Tim McGraw, Billy Joel, Kenny Chesney, Alan Jackson, and Asleep at the Wheel. Many of these performers gathered together for the tour's final concert in Arlington, Texas, before 104,793 fans—the largest ticketed attendance at a single-show concert in the United States. The concert also set a record for the largest gross at a single-show country concert, $18,194,374, and broke the 33-year-old record as well for "largest indoor concert ever," easily surpassing the 87,500 fans who attended the 12/5/81 Rolling Stones concert at the New Orleans Superdome (opening acts, The Neville Brothers, followed by George Thorogood and The Destroyers). A live album recorded from the final concert in Arlington titled The Cowboy Rides Away: Live from AT&T Stadium was released on September 16, 2014, with a DVD/CDs of the concert being released on November 10, 2014, with Wal-mart exclusively releasing a Deluxe edition including 2 cd's as well. This Deluxe DVD is the entire 3+ hour concert and the accompanying 2 cd's have 28 of the 40 songs sung that night. On August 29, 2014, the Country Music Television channel broadcast a two-hour concert special of the event titled George Strait: The Cowboy Rides Away. This CMT concert special had 1-1/4 hours of music from the 3+ hour concert, and interviews. Strait eloped to Mexico with his high school sweetheart Norma in December 1971. Their first child, Jenifer, was born on October 6, 1972. Their son, George Strait Jr., known as "Bubba", was born in 1981. Jenifer was killed in an automobile accident in San Marcos on June 25, 1986, at age 13. The family set up the Jenifer Lynn Strait Foundation, which donates money to children's charities in the San Antonio area. George Strait Jr., who is a graduate of Texas A&M in College Station, used to compete as a Professional Rodeo Cowboys Association (PRCA) team roping competitor. Strait was able to watch his son compete at the Houston Livestock Show and Rodeo in 2006 shortly before taking the stage for his own performance. Since 2010, Strait has served as spokesman for the Wrangler National Patriot program, a campaign designed to raise awareness and funds for America's wounded and fallen military veterans and their families. Strait says, "I've been a part of the Wrangler family for a long time... when they came to me with the idea for supporting fallen and wounded American veterans and their families, I knew I wanted to get involved." In February 2012, Strait became a grandfather when George Strait Jr. and his wife Tamara had their first child, a son. According to reports, he was named George H. Strait III as a tribute to his grandfather. Strait owns a Gulfstream G450 business jet and carries a personal registration N518GS. His personal aircraft is housed at the Landmark Aviation facility in San Antonio. He has teamed up with Texas Governor Greg Abbott to help with disaster relief efforts in the wake of Hurricane Harvey, which devastated coastal areas of Texas. Strait along with long time friend and business partner Tom Cusick created the Vaqueros Del Mar (Cowboys of the Sea) Invitational Golf Tournament and Concert held annually at Strait and Cusick's Texas Hill Country resort Tapatio Springs Resort in Boerne Texas. The Invitational raises money for David Feherty's Troops First Foundation, benefitting wounded servicemen, servicewomen and their families. Since its beginning in 2012, more than 5 million dollars (USD) has been raised by the events. In January 2018, George Strait was named the 2018 Texan of the Year by the Texas Legislative Conference, a statewide group of business and political leaders. Strait is being honored for his fundraising efforts in the wake of the widespread flooding following Hurricane Harvey. Strait's maternal grandmother was Mattie Louise Gise (née Strait), through whom he is a cousin of Jeff Bezos, founder, chairman, and chief executive officer of Amazon.com, the world's largest online shopping retailer (which happens to have significant economic ties to Texas). In more than 30 years of recording, all of which have been spent with MCA Records, George Strait has garnered 61 No. 1 songs on all country charts (including Mediabase 24/7, the former Radio & Records chart, and the now-defunct Gavin Report chart), and has more No. 1 hits than any other artist in any genre. His 44 Billboard country number 1 hits are a record, four more than Conway Twitty's total that includes several duets with Loretta Lynn. Additionally, Strait is also the first artist in the history of Billboard to have at least one single enter the Top 10 of a Billboard chart for 30 consecutive years, starting in 1981 when his debut single "Unwound" peaked at No. 6 on the Hot Country Singles chart. All of his Top 10 singles have been on that chart. Strait has sold more than 68 million records in the United States alone and his certifications from the RIAA include 13 multi-platinum, 33 platinum, and 38 gold albums. Strait has acted in several films. He had a bit part in The Soldier (1982) and starred in Pure Country (1992). He also appeared as himself in Grand Champion (2002). The film Pure Country featured George Strait in the lead role as Dusty Chandler, a famous country singer who strays too far from his country roots and traditional sound. It provided the opportunity for Strait to branch out from his own traditional country sound for a more rock-and-roll approach. The film saw little success at the box office, taking in only $15 million, but the soundtrack, also called Pure Country, produced several hit singles for Strait, and has become his best-selling album to date. Strait had a limited role in the sequel to Pure Country, Pure Country 2: The Gift. Strait holds the record for most number one albums and singles, gold albums, platinum albums, and multi-platinum in the history of country music, and is eleventh in the most number one albums in all other genres. Strait is third only to Elvis Presley and The Beatles with the most gold and platinum albums in the history of music. Strait has been certified as the twelfth best selling artist in American history, with career record sales of 70 million. Strait has recorded the most number one songs and top five songs in the history of music of any kind, and is the only artist in the history of music of any kind to have a top ten hit every year for 30 years. He is also second all-time in top ten hits in the history of music, currently 5 away from breaking the all-time record held by Eddy Arnold who had 92 in his historic career. Strait has also won 22 CMA Awards, including consecutive Entertainer of the Year honors in 1989 and 1990, and also just recently won that same honor in 2013 (and is the only artist to win the top honor in three different decades) and holds the career record for CMA nominations (as a whole) and the most consecutively of all time. As of 2009 he holds the record for the most CMA awards. Strait also holds those same records for wins and nominations for the ACM Awards. Strait was elected into the Country Music Hall of Fame in 2006, performing his then-latest No. 1 hit "Give it Away" right before accepting his replica Hall of Fame plaque at the 40th CMA Awards. He was only the second artist (after Eddy Arnold in 1966) to be inducted into the Hall of Fame while still actively recording and producing chart-topping hits and albums. As of June 8, 2010, Strait was named the top country music artist of the past 25 years according to Billboard. In October 2008, the Academy of Country Music Awards named Strait their Artist of the Decade for the 2000s. He was presented the award by the previous winner Garth Brooks. Past winners of the award are Marty Robbins (1960s), Loretta Lynn (1970s), Alabama (1980s) and Garth Brooks (1990s). And with the win of the entertainer of the year award in 2013 he is the only artist to ever win the entertainer of the year in three different decades and also was the oldest winner. The win is currently the longest span between wins for that award as well. Strait is also tied with Merle Haggard for the most male vocalist of the year awards. On June 1, 2013, Strait appeared in The Alamodome, in San Antonio, Texas, before 70,000 fans in the last concert of the first half of his two-year farewell tour. 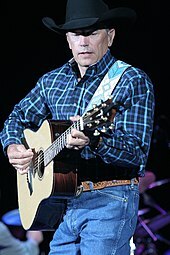 Governor Rick Perry, who was in attendance with First Lady Anita Thigpen Perry, announced that henceforth May 18, Strait's birthday, would be "George Strait Day" in Texas. 1996 TNN/Music City News Video of the Year "Check Yes or No"
1996 TNN/Music City News Single of the Year "Check Yes or No"
1996 Music City News Country Single of the Year "Check Yes or No"
1999 Country Weekly Golden Pick Awards Favorite Song "I Just Want to Dance with You"
1999 Country Weekly Golden Pick Awards Favorite Line Dance Song "I Just Want to Dance with You"
2000 Country Weekly / TNN/CMT Music Awards Single of the Year "Write This Down"
^ Villalva, Brittney R. (September 27, 2012). "George Strait Farewell Tour Announced". The Christian Post. Retrieved October 18, 2014. ^ Bego, Mark (2001). George Strait: The Story of Country's Living Legend. New York: Citadel Press. ISBN 978-0806522586. ^ Trust, Gary (December 29, 2009). "Best of 2009 by the Numbers". Billboard. Retrieved January 8, 2010. ^ "George Strait Earns 60th No. 1 Hit". Radio.com. May 21, 2013. Retrieved June 17, 2013. ^ Waddell, Ray (2013). "Legend of Live Goes Country". Billboard. 125 (44): 55–56. ^ Tipping, Joy (June 8, 2014). "George Strait Sets a U.S. Concert Attendance Record ..." The Dallas Morning News. Archived from the original on June 11, 2014. Retrieved June 8, 2014. ^ Weatherford, Mike (September 22, 2015). "George Strait will play multiple dates in new MGM arena". Las Vegas Review-Journal. Retrieved May 5, 2016. ^ a b c d Bego 2001, p. 7. ^ "George Strait's Father Dies at Age 91". CMT. June 4, 2013. Retrieved October 18, 2014. ^ a b c "About George Strait". CMT. Retrieved December 19, 2012. ^ McCafferty, Dennis (January 21, 2007). "Straight Talk". USA Weekend. Retrieved October 18, 2014. ^ a b Kingsley, Paul (1995). Straight Out of the Box (booklet). George Strait. MCA Records. ^ a b c d Erlewine, Stephen Thomas. "George Strait". All Music Guide. Archived from the original on November 11, 2006. Retrieved October 18, 2014. ^ "Billboard Hot Country Singles". Billboard. Nielsen Business Media. 93 (31): 46. August 8, 1981. Retrieved October 18, 2014. ^ a b c d e f g h Erlewine, Stephen Thomas. "George Strait Biography". AllMusic. Retrieved October 18, 2014. ^ a b "George Strait Discography". CMT. Retrieved October 18, 2014. ^ a b Speers, W. (June 27, 1986). "Strait's Daughter, 13, Is Killed In A Car Crash". Retrieved October 18, 2014. ^ "The Jenifer Strait Memorial Foundation". Straight Fever. Retrieved October 18, 2014. ^ a b Nash, Alanna (April 12, 1991). "Chill of an Early Fall". Entertainment Weekly. Retrieved October 18, 2014. ^ Dresdale, Andrea (November 5, 2001). "George Strait: The Road Less Traveled" (PDF). Rolling Stone. Archived from the original (PDF) on September 24, 2015. Retrieved October 19, 2014. ^ Stark, Phyllis (2007). "Being George Strait". GACTV. Archived from the original on October 19, 2014. Retrieved October 19, 2014. ^ Morris, Edward (May 15, 2009). "Rollin' on the River: BMI Salutes Writers of George Strait's "River of Love"". CMT. Retrieved December 19, 2012. ^ "George Strait Tops Billboard's List of Top 25 Country Artists of the Past 25 Years". Billboard. June 7, 2010. Retrieved October 19, 2014. ^ "George Strait to Release New Single ..." George Strait. October 26, 2012. Archived from the original on October 19, 2014. Retrieved October 19, 2014. ^ Thompson, Gayle (March 15, 2013). "George Strait '60 for 60' Movement Asks Fans to 'Give It All We Got'". The Boot. Retrieved October 19, 2014. ^ "George Strait Presented Billboard Legend of Live Award". CMT. November 15, 2013. Retrieved October 19, 2014. ^ Hollabaugh, Lorie (November 15, 2013). "George Strait Crowned "Legend of Live" at Billboard Touring Awards". Music Row. Retrieved March 24, 2014. ^ Mansfield, Brian (August 15, 2013). "George Strait gets 'Billboard' Legend of Live award". USA Today. Retrieved March 24, 2014. ^ McAfee, Tierney (April 19, 2015). "George Strait's ACM Awards Performance: All My Exes Live in Texas". People.com. Retrieved August 1, 2015. ^ a b "The Cowboy Rides Away Tour ..." George Strait. Retrieved September 9, 2014. ^ "George Strait Tour, 2013 and 2014 George Strait Concert Tour Dates". George Strait Tour Dates. Archived from the original on April 12, 2013. Retrieved April 14, 2013. ^ Duffy, Thom (March 3, 2014). "George Strait, Martina McBride Turn New Jersey Into Cowboy Country". Billboard. Retrieved March 4, 2014. ^ Chris Chamberlain (December 20, 2018). "Còdigo is more than just a George Strait song... it's his brand of tequila". Sounds like Nashvilleaccess-date=21 February 2019. ^ Carter, Maria (September 14, 2017). "Every Hopeless Romantic Should Read George and Norma Strait's Love Story". Country Living. Retrieved March 29, 2019. ^ Netemeyer, Sarah (May 31, 2016). "Meet George Strait's wife, Norma Strait". Country Fancast. Retrieved May 16, 2017. ^ "Jenifer Strait". RachelJoyScott.net. Archived from the original on March 8, 2007. Retrieved March 15, 2007. ^ "Strait Heir". WGNA. Retrieved September 14, 2012. 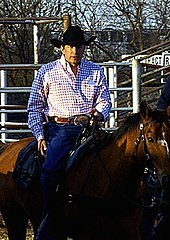 ^ "Rodeo announces special guest George Strait to perform in 2013 - ABC13 Houston Archive". Abc13.com. Retrieved March 29, 2019. ^ a b "George Strait Remembers Fellow Veterans". American Profile. November 2, 2011. Retrieved November 13, 2011. ^ Garner, Blair (February 8, 2012). "George Strait is a grandfather". After Midnight. Archived from the original on January 16, 2013. Retrieved February 10, 2012. ^ "Registration Details For N518GS (George Strait Productions Inc) Challenger 300". Planelogger.com. ^ "King of Country George Strait, Gov. Greg Abbott visit Rockport". Kristv.com. Retrieved November 20, 2017. ^ "Vaqueros Del Mar Invitational Photo Gallery". Tapatioresort.com. ^ "George Strait's 7th Annual Vaqueros Del Mar Invitational raises $1.5+ Million". Countryschatter.com. November 3, 2017. ^ "George Strait Raises Over $1.5 Million In Seventh Annual 'Vaqueros Del Mar Invitational'". Allaccess.com. ^ "George Strait Named 2018 Texan of the Year". Cmt.com. ^ "George Strait Named 'Texan of the Year'". Rollingstone.com. ^ "Jeff Bezos' roots could give Texas an edge as Amazon.com looks for new HQ site", dallasnews.com; accessed January 25, 2018. ^ Stark, Phyllis (February 26, 2006). "Being George Strait". American Chronicle. Retrieved March 15, 2007. ^ "George Strait First to Achieve 30 Consecutive Years of Top 10 Hits". CMT News. April 14, 2010. Retrieved May 23, 2010. ^ "Top Selling Artists (only with the albums)". RIAA. Archived from the original on July 1, 2007. Retrieved November 20, 2012. ^ "Top Awarded Artists". RIAA. Archived from the original on July 11, 2013. Retrieved November 20, 2012. ^ "George Strait Will Have Limited Role in New Film". MTV Networks. Retrieved March 15, 2010. ^ Betts, Stephen L. (June 4, 2009). "George Strait Catching Up to Beatles, Elvis". The Boot. Retrieved November 2, 2012. ^ "George Strait Sets Billboard Record". Gather. April 14, 2010. Archived from the original on January 16, 2014. Retrieved November 2, 2012. 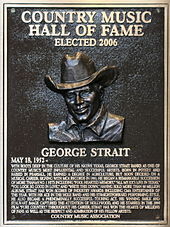 ^ "Meet George Strait: Awards". George Strait. Archived from the original on December 28, 2012. Retrieved December 19, 2012. ^ Saldana, Hector (June 2, 2013). "On farewell tour, superstar George Strait in harmony with hometown fans". My San Antonio. Retrieved June 5, 2013. ^ a b c d e f g h i j k l m n o p q "Winners". Academy of Country Music. Retrieved May 5, 2016. ^ a b c d e f g h i j k l m n o p q r s t u v "Past Winners". Country Music Association. Retrieved May 5, 2016. ^ "Cheyenne Frontier Days Hall of Fame Inductees". Cheyenne Frontier Days. Retrieved October 10, 2018. ^ "George Strait Tops Billboard's List of Top 25 Country Artists of the Past 25 Years". Billboard. Bego, Mark (2001). George Strait: The Story of Country's Living Legend. New York: Citadel Press. ISBN 978-0-8065-2258-6. Dickinson, Chris (2012). Kingsbury, Paul (ed.). The Encyclopedia of Country Music. New York: Oxford University Press. ISBN 978-0-19-539563-1. 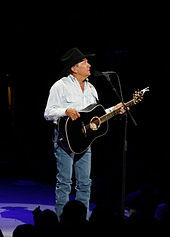 Wikimedia Commons has media related to George Strait.